Fewer people are moving away from the south Wales valleys and more are setting up home in the area because of lower house prices, it is claimed. But while decades of population decline is finally slowing, more action is needed to ensure it continues, says the Institute of Welsh Affairs think-tank. This includes better houses and merging local councils to improve services. 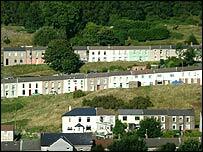 Meamwhile, there are hopes of a Wales centre of excellence in regeneration based in the Heads of the Valleys. John Osmond, director of the Institute of Welsh Affairs (IWA), said: "The trends show that a steep decline in population of recent decades has been slowed over the past five years which, if continued, provides evidence of a rejuvenation. "The change is almost certainly due to lower house prices at the top end of the valleys making them more attractive to low income families and first-time buyers." But he said the next challenge was to attract people who wanted to live in the area, and not just because it was cheaper than Cardiff. To do this, more attractive housing developments should be built and councils should work closer together - and in the long-term merge - to ensure better service and governance, he said. "The key challenge now is to devise regeneration policies that build on the strengths of the heads of the valleys in other respects," he said. "Certainly they should have a competitive advantage in being so close to the Brecon Beacons National Park." The conference held in Hirwaun on Thursday will hear from Leighton Andrews, AM for Rhondda and deputy minister for regeneration, who will also talk about the need to overhaul council housing stock. "This in itself will provide local jobs and improve skills," said Mr Osmond. But Mr Osmond conceded the key to regeneration will be the ability to change perceptions about the valleys, which have social problems such as high unemployment and poor health. He said: "A lot of people who live and work in Cardiff don't go to the valleys and they have a perception of it being a bit 19th Century. "But the valleys are green again and are on the doorstep of the Brecon Beacons. "If you say to people you could live in a National Park 30 minutes from Cardiff where the cost of living is less... we should see the valleys as an opportunity, not as a problem." Professor Kevin Morgan, an expert in regional development and a keynote speaker at the IWA conference, said the "post-coal era" valleys had suffered a "noxious cocktail of poverty, low skill and ill health, all of which feed off each other". He said the area needed better housing quality and improved transport connections, particularly for rail. He added: "But we also need jobs in the valleys because we can't assume that Cardiff can save the valleys and that everybody in the valleys who's unemployed or economically inactive can somehow find a job in Cardiff." Meanwhile, a working group is to look at the potential for creating a Welsh centre of excellence in regeneration based in the Heads of the Valleys. Deputy regeneration minister Leighton Andrews said groups involved in housing, regeneration, business and local government would be invited to take part. "We would expect the centre to be located in the Heads of the Valleys but it would draw on existing academic and professional expertise in Wales," he said.